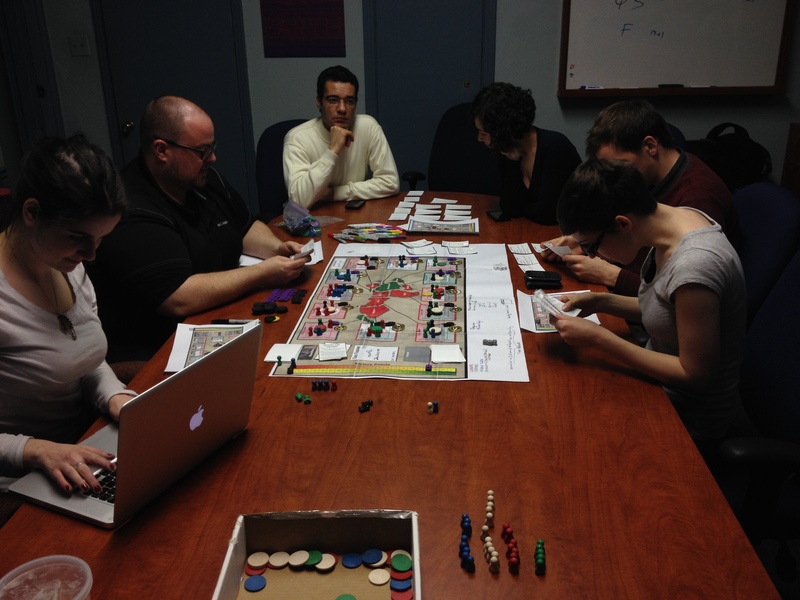 We had another playtest of Corinne Goldberger’s Arab Spring game at ICAMES last night. Once again, I thought it went extremely well, and—more importantly—our group of new players all picked it up very quickly. All of the basic game mechanics worked smoothly, or need only minor tweaking. Next she’ll face the challenge of writing up the rules in a clear and effective way. In the game, the two opposition players joined forces to successfully “occupying the square” in Yemen in December 2010. 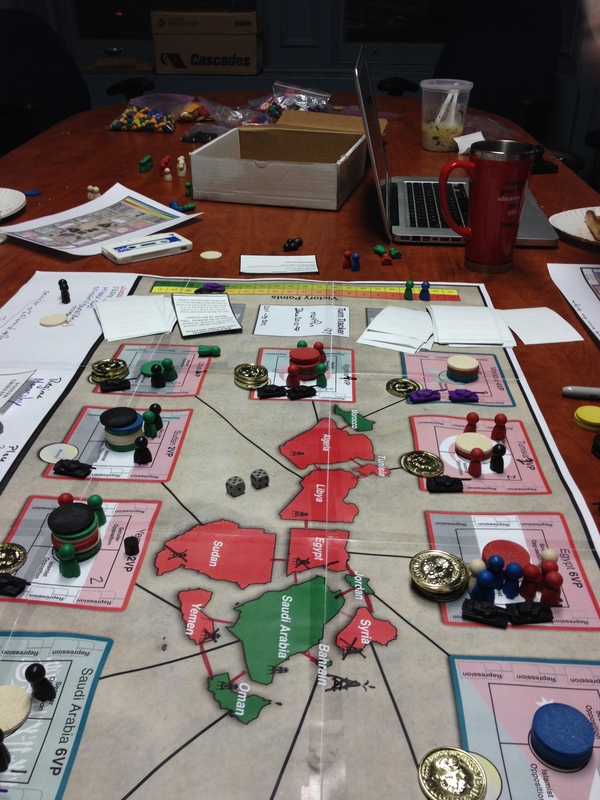 The game uses a Freedom in the Galaxy -like domino effect mechanism, so the action there had the effect of generating grievances and activists in other countries, much like the informational cascades which characterized the real Arab Spring. The republican regime player lacked the card necessary to “clear the square,” and within a month the country tipped into full-scale revolt, causing President Saleh to flee. Closely-fought elections followed a few months later, which the Islamist opposition player won. At this point, the number of activists and grievances was growing in both Egypt and Sudan. The opposition players decided to focus on Sudan, where they had a slight edge and where the regime had less repressive capability (tanks). They occupied the square too, then overthrew the regime, while an attempted counter-coup by pro-regime forces failed. Efforts by opposition forces to hold quick elections were stymied by conservative judges appointed under the earlier dictatorship. While the overthrow of two republics in quick succession certainly made the republics feel very vulnerable, it may have been a blessing in disguise. With opposition energies focused on two low-value countries (both Sudan and Yemen are only worth 2 victory points), the republics launched a series of reforms and repression in Egypt (6 VP) intended to reduce grievances and eliminate activists. In the Arab Spring, you need both to successfully challenge regimes: grievances have no effect unless there are activists of a similar kind (youth, workers, middle class, and rural), and activists are of no value if there are no significant social grievances to play upon. Egypt also increased military expenditures, thereby gaining an additional “tank” (signifying the repressive strength of the state). With the Mubarak regime in Egypt consolidating its position, both opposition players then went after Algeria. The Algerian regime responded by using its oil money to co-opt some opposition activists, and then—in a striking display of the ruthless efficiency of the mukhabarat state (or good dice-rolling) arrested all of the others. Tunisia clamped down for good measure too, while Libya announced new social programmes designed to address popular discontent. Through much of the first two-thirds of the game, the monarchical player had felt quite secure. Opposition energies were largely focused on the republics. The Gulf monarchies were awash with resources, in part because of high oil prices. Morocco and Jordan were a little more vulnerable, but generally any growth of activists or grievances there were met by appropriate responses quite quickly. Then it all started to go wrong. In the tiny island kingdom of Bahrain, a combination of sectarian tensions and youth activism was beginning to challenge the regime. Demonstrators occupied Pearl Roundabout. Saudi Arabia sent in massive military forces to help quell the protests. This however, wasn’t enough. As violence mounted, the protestors forced the Khalifa dynasty from power. A revolution in the Gulf! Who would have thought it possible? The shockwaves were immense. Protestors in Saudi Arabia tried to mobilize, but failed. However, in Oman they were more successful. Moreover, under the game rules the monarchy player, who otherwise would be in contention for first place, automatically loses if a single monarchy is overthrown at the end of the game. It all came down to the last turn, November 2011. The monarchy player hoped that a “counter-revolution” of royalist officers and foreign mercenaries in the armed forces would be able to turn back the clock in Bahrain—or, if that failed, trigger a civil war which the better-armed royalists might win. They were unable to do so, however. 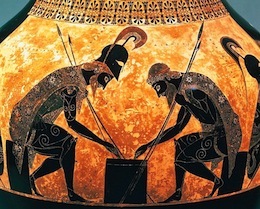 Thus the game ended with the opposition players neck-and-neck at around a half-dozen victory points each. The royalists had many more, but the loss of Bahrain meant that they automatically lost the game. The republican regimes had 18 VP, and so were the winners. 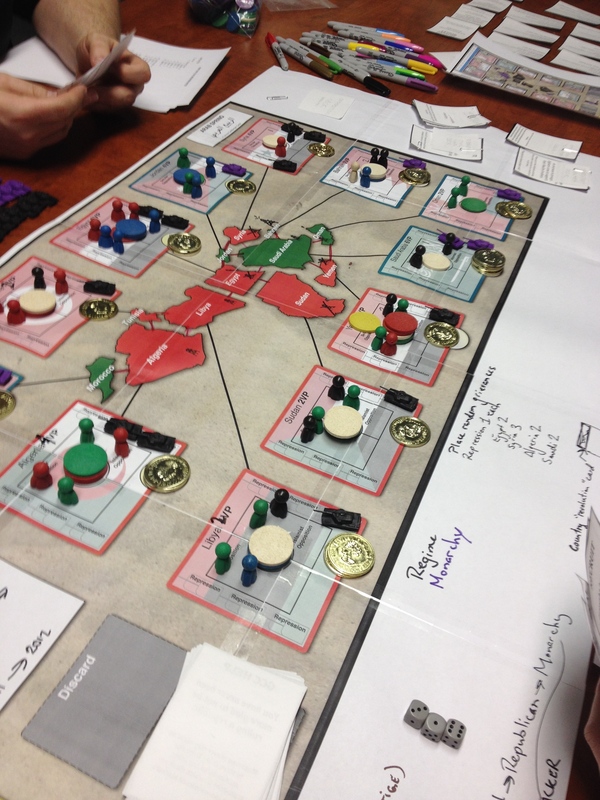 Despite the apparently large winning margin, the game had been very close—indeed, the republics spend the first half of the game convinced they were a losing cause, the oppositions had been quite buoyant until things began to bog down for them mid-game, and the monarchies went from a strong position to losing in the last few months/turns of the game. Had Egypt fallen the republican player would have lost 6 VP, and the opposition players could have gained as many as 10 VP, entirely changing the outcome. Thus the game manages to both reflect real-world dynamics but to give everyone a real chance at “winning.” I’m really impressed with the design. I am really impressed by your descriptions of play… seriously, have you talked to Corinne about getting this published? Once she’s finished the course, the current plan is to playtest much more and tweak over the summer, and then either self-publish via Gamecrafter, or see whether an existing publisher would be interested. I am also impressed by the descriptions of this game, and I am curious to know how further tweaks have progressed and if Corinne will publish it soon? Labyrinth II is on my must-buy list when it is published, and I am eager to have another view on the topic. Many congratulations Corinne on graduation and your world trip!! I’m hopeful that you will continue to develop and publish your game.